I wish that different literatures were mutually translated, bypassing English or other dominant global languages. Very rarely does contemporary Uzbek prose get translated directly into English. Yet English readers have just been given a rare chance to discover the novel The Devils’ Dance (Tilted Axis Press, trans. by Donald Rayfield), by the prominent Uzbek writer and journalist Hamid Ismailov. In it, Ismailov introduces the curious reader to perhaps the most famous modern Uzbek writer, Abdulla Qodiriy. The novel tells the story of Qodiriy, who, like many intellectuals in the Soviet Union in the late 30s, was imprisoned and eventually shot dead. While in jail, Qodiriy attempts to recreate the unfinished novel the KGB has just confiscated, which portrays Oyhon, a poet-queen who lived in the last, grand days of nineteenth-century Turkestan when London and Saint Petersburg were fighting over Central Asia in the Great Game. 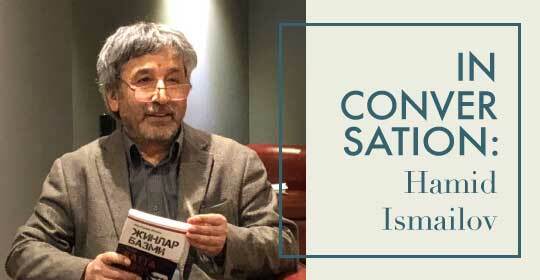 I interviewed Ismailov about his diverse identities and the place of Uzbek literature in today’s global writing. Filip Noubel (FN): You are a global writer: you were born in what is today Kyrgyzstan, studied and worked in Uzbekistan, and now live in London. You write in both Uzbek and Russian, and appear in translation in a number of languages ranging from English to Chinese. In your books and interviews, you often refer to the plurality of cultures but also to their clashes. How is this multiple identity shaping your writing? Hamid Ismailov (HI): Recently I did a DNA test, and aside from the obvious, I discovered that 4% of my genes are of South Asian origin and 2% are Irish, not to mention 1% Native American. So if my genes are telling me that I’m related to people like Rabindranath Tagore and James Joyce even on a genetic level, so be it! But, generally, the people of Central Asia, which is an area historically placed in the middle of the Silk Road, should be blessed to be born into multiculturalism, multi-lingualism and multi-identity. If you read my book The Railway you can see how many nationalities, traditions, and ways of life I have been exposed to in my childhood, so no wonder that I love to write in different languages, and to put myself into different shoes. In fact, exploring “otherness” both as a subject and an object is the most interesting part of literature.